For years, Microsoft Surface fans have wondered two things: First, would Microsoft ever sell a standalone version of its massive Surface Studio display? And second, when would the company update its Surface Dock? The Kensington SD7000 Surface Pro Docking Station answers both questions...sort of. 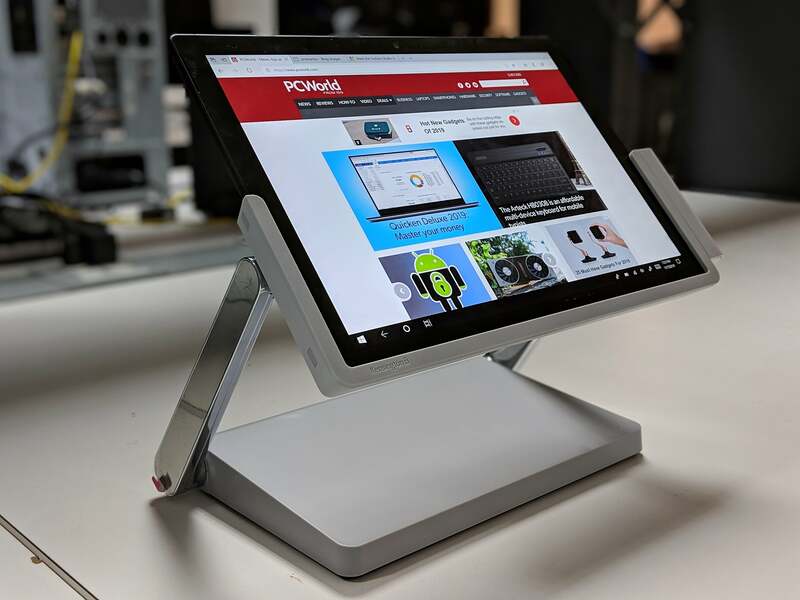 Put simply, Kensington’s SD700 features the “zero-gravity hinge” construction of the Surface Studio, but instead of a massive 25-inch, 4.5K screen, there’s a partial frame which can hold a Surface Pro 4, Surface Pro (2017), or Surface Pro 6. 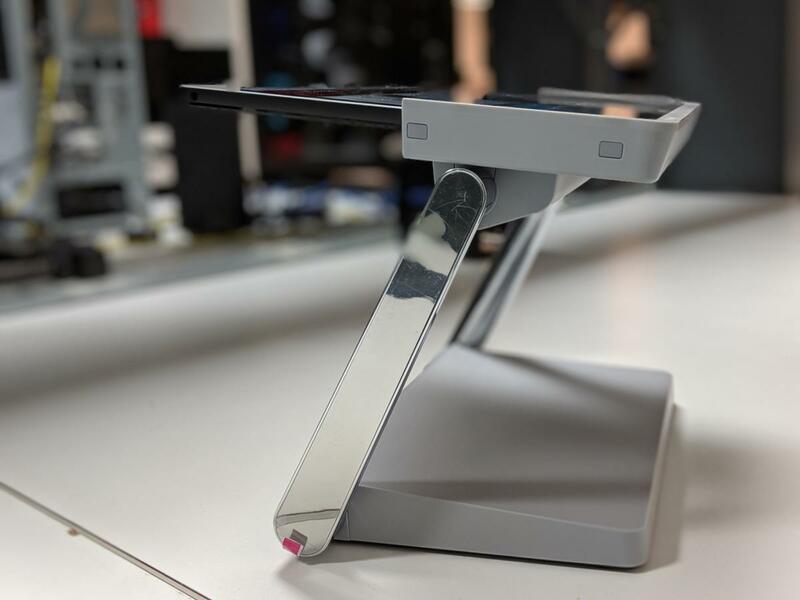 We’d call the SD7000 a sort-of hybrid between a tablet stand and a dock, which can also serve as an inking surface should you need that. The Kensington SD7000 docking station. In some ways, the Kensington SD7000 reminds me of the first generation of Surface Pro docks, which “grabbed” each side of the tablet and featured a port extender at the Surface Connector slot. To use the SD7000, you slide the Surface Pro tablet into the SD7000’s frame, then hold the device in place by snapping a side handle closed. Naturally, you’ll immediately discover one limitation: You have to remove the Type Cover. ...and here the SD7000 is in “easel mode.” It doesn’t recline as far as the Surface Pro 6 kickstand allows, but it provides a sturdier surface. In all, it’s a solid idea, executed solidly—until you factor price into the equation. The Kensington SD7000 docking station costs $399.99—which sounds exorbitant, and it is. The one saving grace is that Microsoft already charges, $199 for the Surface Dock though prices are lower elsewhere. Though the Surface Pro is a mobile device, the SD7000 decidedly isn’t: At 7.28 pounds, the SD7000 is weighted to hold the Surface Pro firmly. 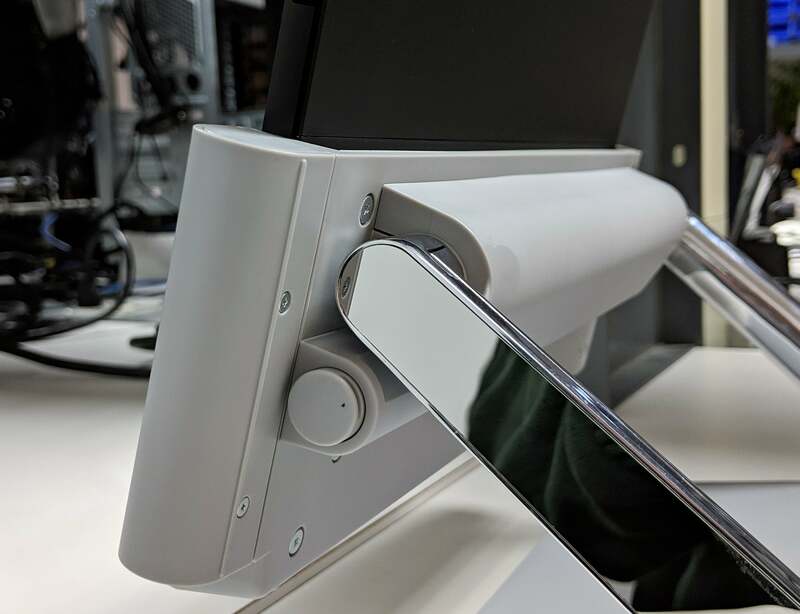 Though the SD7000’s construction is plastic, a large metal hinge and arms smoothly moves the tablet receptacle flat upwards through 65 degrees or so. A secondary hinge also rotates the receptacle itself by about 90 degrees. Kensington’s SD7000 is what we’d call “dashboard mode.” This is something that the tablet by itself can’t do. 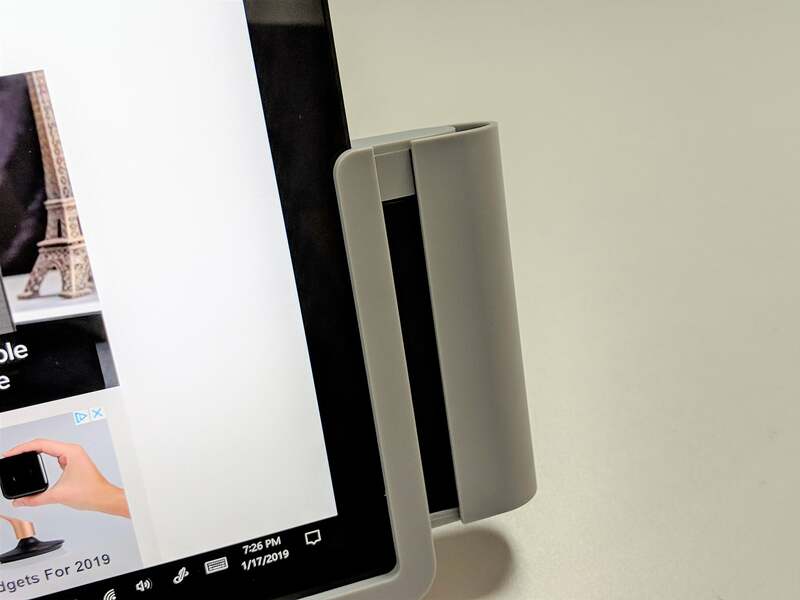 Both hinges allow you to adjust the tablet through a wide range of positions. 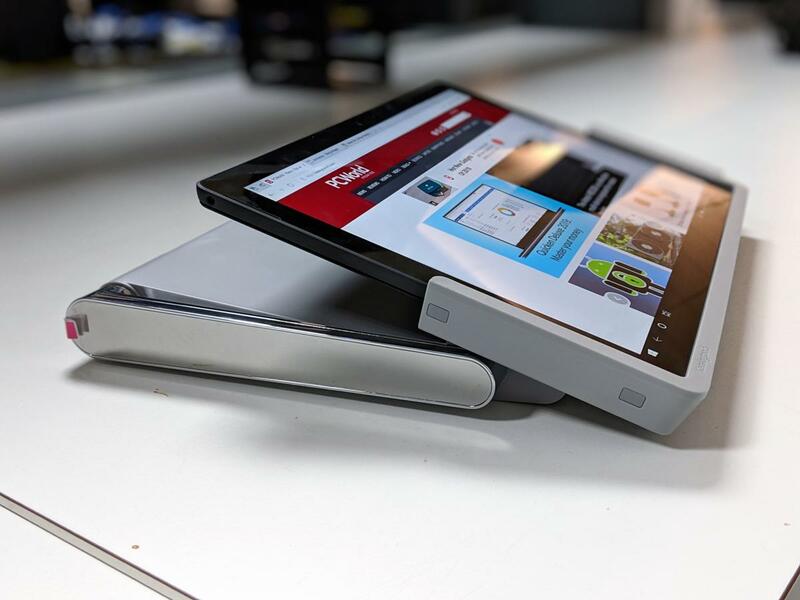 At its highest point, the tablet can’t get quite vertical, though the slight angle is actually more ergonomic. At its lowest point, the tablet reclines to about 30 degrees. 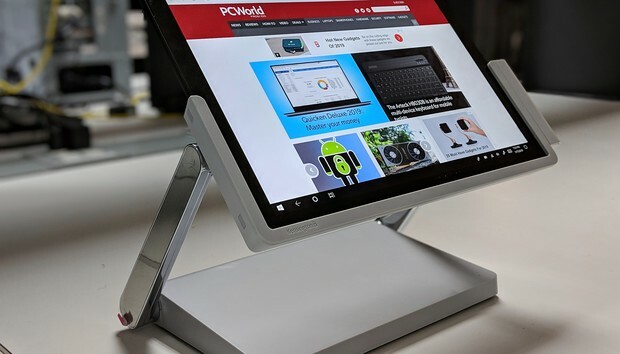 Unfortunately, the hinge isn’t quite strong enough to support the full weight of the tablet if you lower it close to the desktop, so it sags until the tablet’s weight is supported by the flat surface. On the other hand, the SD7000’s construction also allows you to place the dock on a desk, then drop it down to where it’s hanging off the edge, onto a keyboard drawer. A retaining handle snaps in and out, connecting power and I/O to the Surface tablet and holding it in place. The SD7000’s inability to support the tablet’s weight is annoying if you’re planning on using it as a monitor; as an inking surface, the sag is perfectly acceptable. Keep in mind that the built-in kickstand of the Surface lineup allows you to recline the tablet further than the SD7000, though with a bit of unwanted springiness that isn’t present in the SD7000. The frame goes just partway up the Surface tablet, providing plenty of area for the tablet to cool itself under load. 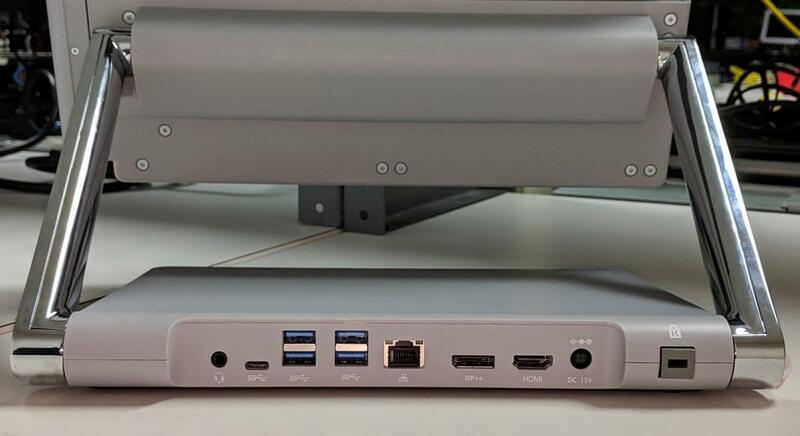 Unfortunately, as a dock, the SD7000 is hampered by the limitations of the Surface Connector—though the dock can support more than one physical display, only a single 4K display can be run at 60Hz. If two are connected, the display bandwidth must be split into two 4K connections at a sub-standard 30Hz—a limitation of the Surface, however, and not the SD7000. A closer look at the hinges that allow the SD7000 to raise, lower, and swivel the Surface tablet. The ports on the rear of the Kesington SD7000. Don’t forget the Kensington lock to the far right! Kensington’s SD7000 plays into the odd little ecosystem of devices that can control more than one PC at a time, enabled by apps like Microsoft’s own Mouse without Borders app, as well as the Logitech MX Master 2S and its Logitech Flow technology. 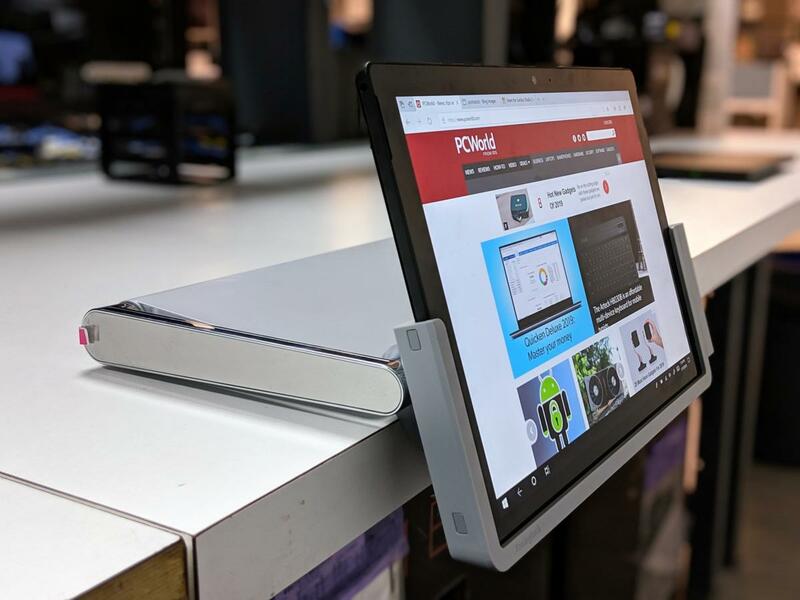 It’s up to you whether you’ll want to use the Surface Pro tablet as your primary device, or just use the SD7000 to put it in a convenient position as a a secondary display. Either way, convenience is a pricey proposition for the SD7000. But without Microsoft stepping in to provide its own docking alternative, who can blame Kensington for cashing in?